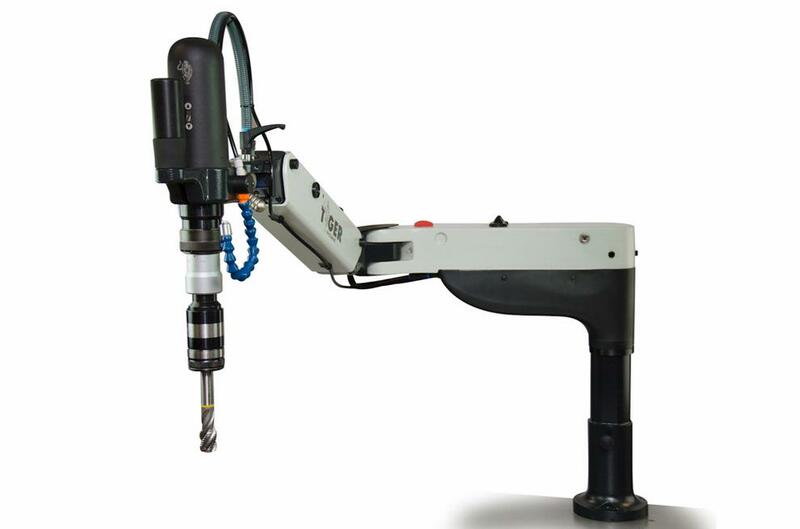 The machine itself consists of a radial arm joint to a tilting arm balanced by means of a pneumatic spring. The head member and the electric motor find themselves at the end of the tilting arm and is adapt to always move at right angle with respect to its working area. Through the base (1) and by means of three M8 (120º) screws the machine can be fixed to a table or workbench. Such attachment can also be obtained by means of a simple clamp. The speed is regulated by means a variator board located in the “electronic box casing”. The turning motor speed and the optional automatic lubrication and depth control are adjustable by means of the buttons being located over the “radial arm”. The speed can be thus adapted to every thread type. Equipped with a single phase (220V or 110V) HIGH FREQUENCY MOTOR, is able to adapt the modular system consisting in a series of 7 quick-change modules (reducers). As a result of this output speeds are available thus allowing to adapt the tap speed to every type of thread.